At some point, you’ve probably been in a small group that seemed as lively as a koi pond on a hot day. Life was barely discernible. The group seemed to have little direction. No one was willing to take responsibility. Everyone was “nice” and presented a good face with very little disagreement offered. Certainly, no one was going to hint at vulnerability. Yet, you could count on the guy who dominated the conversation and the lady whose prayer requests droned on well past the ending time. Fun times! If you’ve participated in more than one small group, chances are you’ve been in at least one group where pseudocommunity defined the group. In Community That Is Christian, Julie Gorman seeks to the help the church overcome the obstacles of individualism and consumerism that drive the pseudocommunity harming many small groups. Community That Is Christian not only critiques, but gives a strong vision for community that can authentically be labeled Christian. “True community will most likely be shaped by reality and sacrifice. Real community is the place where ego dies…Community is not a commodity – a technique or product of methodology – it is a creation of the Spirit” (82). Gorman has a realistic outlook on community and notes that it cannot be manufactured: “Community is like joy, a by-product, a consequence of being open to what is beyond ourselves. It is not an end in itself” (89). The point she makes here is crucial: Small groups are not ends in themselves. Rather, small groups are a means, a strategy for discipleship. Attending a small group doesn’t guarantee community or discipleship is actually happening. Community building takes effort; being aware of the proper dynamics help. Gorman is on point when she reminds us that when community happens, it is because of God’s presence. “The social contract binding members together asserts only the weakest of obligations. Come if you have time. Talk if you feel like it. Respect everyone’s opinion. Never criticize. Leave quietly if you become dissatisfied” (Gorman quoting Wuthnow, 63). Gorman adds, “Research data indicates that in becoming portable support systems that are under our control, groups may simply salve our consciences and reinforce what we want to hear” (63). Gorman later gives reasons why conflict is actually good for groups to experience and work through. She observes, “Conflict of ideas can prevent stagnation, stimulate involvement and interest, prompt change, help groups move to deeper levels, provoke creative new measures, allow members to be honest, develop thoughtfulness, broaden awareness of perspective, show valuing of difference and uniqueness” (173). Gorman is realistic about overcoming the common dynamics groups encounter. She cites research to back up her idea that groups should be smaller rather than larger (fewer than twenty, as a rule). She addresses the important role of communication in groups, gender and personality factors, and conflict. Her chapter on group stages did not give the usual forming, storming, norming, and performing stages. Rather, she explores group development through the stages of orientation/exploration, power and control, trust, and finally, the productive stage. Gorman’s advice regarding community development, while valuable, seemed much the same as other books that cover such issues. Gorman is particularly strong in giving direction and purpose for small-group ministry. 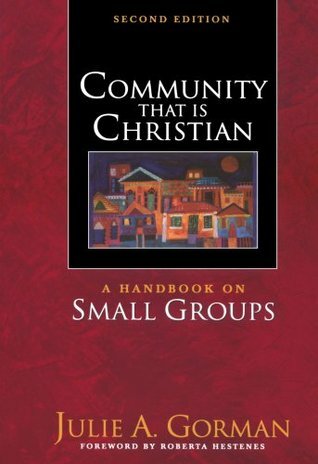 “The purpose of a small group is not meetings but maturity” (94). We could have fun with this quote and replace the word “meetings” with other words like “fellowship,” “study,” and “doing-life together.” Gorman adds necessary goals to groups: “accomplishment of purpose; caring for personal needs of individuals in the group; maintaining healthy relations; and - overarching all three - becoming the people of God in process” (111). The last of the goals, perhaps reworded as discerning God’s presence and going on toward sanctification, is particularly helpful for groups seeking to be more mission focused. “The key point that our research suggests…is that the group process counts, not simply the raw content of the lesson being studied. If spiritual development were only a matter of exposing people to a certain body of ideas, getting them to read the Bible on their own, or inviting them to listen to sermons, these activities might function just as effectively as small groups. But the reinforcement that comes from considering ideas as a group gives them added significance” (Gorman, citing Wuthnow, 99). “The purpose of Christian formation is not developing a better self-image, achieving self-fulfillment or finding self-affirmation; nor is it the development of individualistic qualities that make singularly outstanding saints. Rather, it is developing certain qualities that enable us to live responsibly within the community that we have been baptized into” (Gorman, citing Simon Chan, 244).